Megan Oteri is an educator with vision and purpose. Her forte is helping students find their unique voices, and unleashing the power of story within each child. She has taught a wide range of students and is no stranger to the classroom, having worked with youth from elementary through high school. Her writing and photography has appeared in national publications. She has a Bachelor of Arts in Special and Elementary Education from Providence College and a Master of Arts in English from East Carolina University. Trainings, certifications, and grants include LEGO Education Academy, Kennedy Center National Seminar for Teaching Artists, North Carolina teaching license, National Endowment for the Arts grant recipient, North Carolina and Wyoming Arts Council grant recipient, and Borchardt Study Abroad Award (University of Surrey, England) fellowship. I've written and received numerous grants totaling over $20,000. Some of those grants are National Endowment for the Arts, Wyoming Arts Council, and North Carolina Arts Council grants. Part of this grant included extending my learning experience and knowledge at the Wyoming School Improvement conference where I presented Spoken Word in the Classroom. 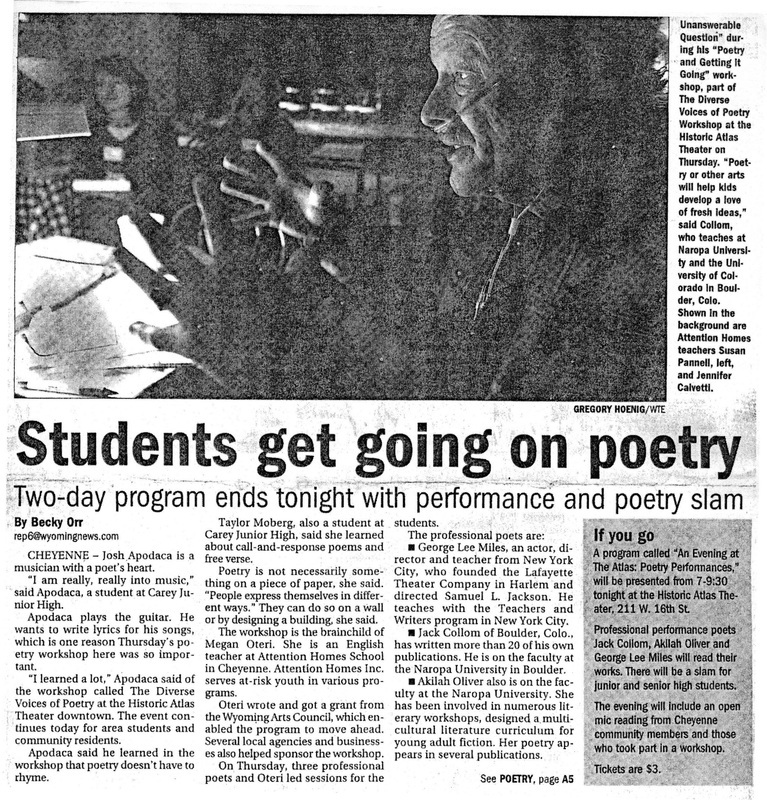 The grant, The Diverse Voices of Poetry was a natural extension to this inspiring experience; which introduced Spoken Word to Wyoming's students and educators. Two-day poetry writing workshop with three professional performance poets, Jack Collom, Akilah Oliver, and George Lee Miles and evening poetry performances, open mic, and poetry slam at the historic Atlas Theater. The total project value of this grant was $7,400, $2,000 awarded to Attention Homes, Inc., residential treatment center in Cheyenne, Wyoming serving at-risk children ages 12-17. I taught Special Education and Language Arts at Attention Homes from 2002-2006. Slideshow below showcases some highlights. 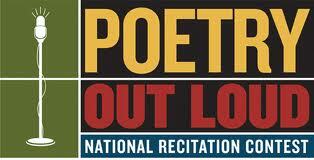 National Public Radio segment and interview about The Diverse Voices of Poetry and Spoken Word in Wyoming. Cue to 16:08 in audio recording. A new poetry movement "Spoken Word" is coming to Wyoming with a workshop on why children in the state are finding poetry by being expressive. 2013 North Carolina Arts Council and Pitt County Arts Council at Emerge Individual Artist Project Grant recipient. I received this grant to conduct on-site archival research at the Evanston History Center in Evanston, Illinois to research The Evanston Community Kitchen. This is an on-going book project I am working on about my great-grandmother and her associates who co-founded the Evanston Community Kitchen, a model for the nation during the early 20th century of centralized kitchens. Experienced educator, North Carolina certification: K-12 Cross Categorical Special Education, K-6 Elementary Education, and 6-9 Language Arts. I enjoyed working with students in residential treatment as a Language Arts and Special Education teacher at Attention Homes School from 2002-2006. Because the focus was on the student's overall emotional health and recovery (many were in residential treatment for various reasons including addiction, abuse, neglect, and delinquency), we were able to educate students at their individual level. I practiced Differentiated Instruction before it was a catch phrase. My students grew at least two grade levels per calendar year under my instruction. I used STAR reading and Accelerated Reader as a supplemental program, which targeted their Zone of Proximal Development (ZPD). The students had so much to write about; I only had to provide them with support, guidance, and the opportunity to express themselves. 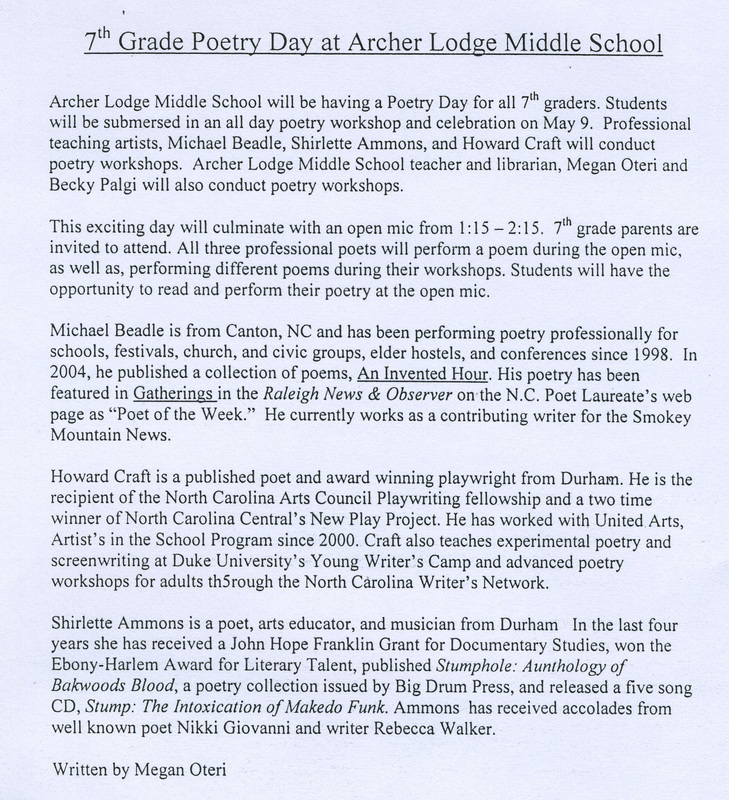 My students often won various writing competitions throughout the regional area and state. I arranged for my students to attend every local poetry slam, where they dominated the competition. Most importantly, they enjoyed expressing themselves (but it should be noted how good they were at it). One of my high school students won third place in the statewide Poetry Outloud competition for his dramatic interpretation of George Eliot's, I Grant You Ample Leave. If you have time, read Becca's creative nonfiction piece (in slideshow below), Insecticide. She was sixteen when she wrote it. She had natural talent and is a gifted writer. I hope she pursued writing as a career. My students won four years in a row from 2002-2006 during my tenure at Attention Homes as the Language Arts teacher. Writing and Technology Integration, North Carolina State University Graduate Course, ECI 519 -- Selected as a Borchardt Fellow to study abroad at the University of Surrey in England, July 2014. Click here to view my online portfolio from the course, as well as a description of the course. I was fortunate to work in Greene County School District as a fourth grade teacher. As a one-to-one school district, Green County students and teachers have daily access to Macbooks, iPads, smartboards, student response systems, iPod touches, and Apple software. Incorporating Envision Math, my students flourished using this program. Some teachers (we can called them old-school) made comments such as, "Her students are always on the computers," as we did have to share our computer laptop cart between three teachers. I habitually signed up for my daily computer slot for my class' math instruction. The result was engaged students, well executed Differentiated Instruction, and the highest End of Grade (EOG) test scores school wide. Technology integration can be intimidating to some teachers. I embraced the opportunity and became a better teacher for it. The above project was created using GoAnimate in North Carolina State University's graduate education course, ECI 519, Writing and Technology Integration at the University of Surrey, England. The project below was created in the same study abroad course using myHistro.com, which was awarded the 2013 American Association of School Librarians 2013 Best Website for Teaching and Learning. I believe technology integration is a great equalizer in the classroom and enables students of all learning abilities to be successful. Technology also engages students immediately, thus eliminating potential behavior problems. Technology integration is a win-win for teacher, student, and administrators.